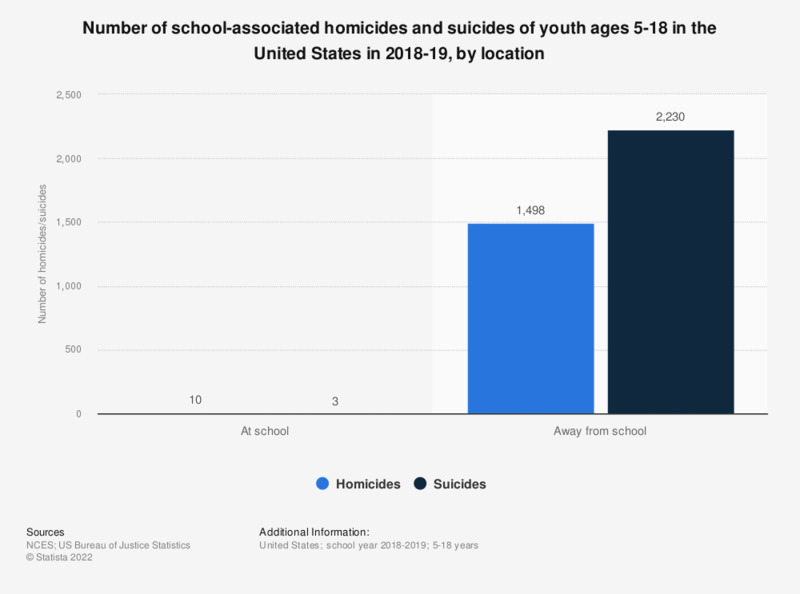 This statistic displays the number of school-associated homicides and suicides of youths aged 5 to 18 years in the United States in 2015-2016, by location. In that school year, 18 homicides were committed at school. *Youth ages 5–18 from July 1, 2015, through June 30, 2016. This number approximates the number of suicides away from school. Use caution when interpreting this number due to timeline differences. NOTE: “At school” includes on school property, on the way to or from regular sessions at school, and while attending or traveling to or from a school-sponsored event. Estimates were revised and may differ from previously published data. No data available for total homicides away from school.